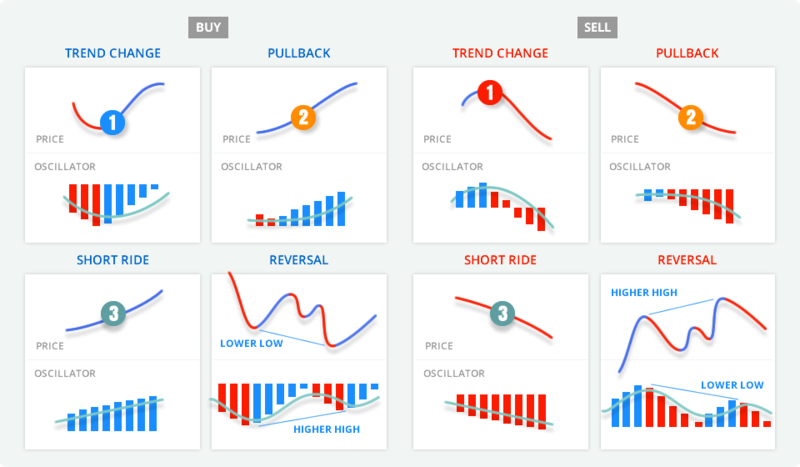 The Trend Trading Indicator is oriented towards trend traders who trade mostly daily charts and can have positions opened for days, weeks or months. 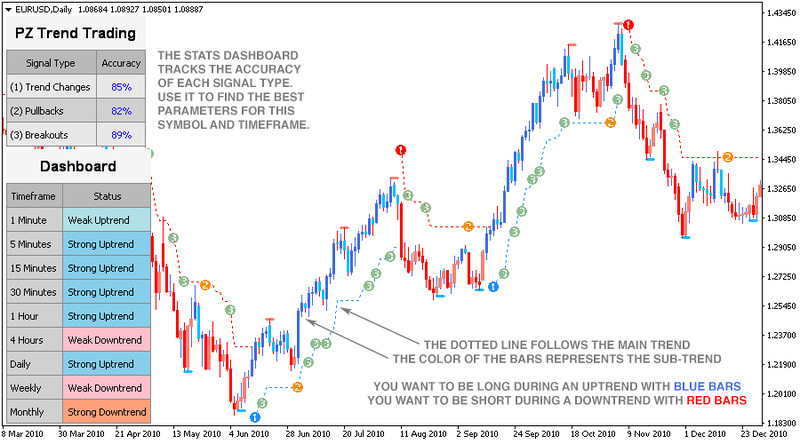 This indicator has not been designed to trade trend changes on small timeframes, but rather, to zoom into what the price is doing during established trends. 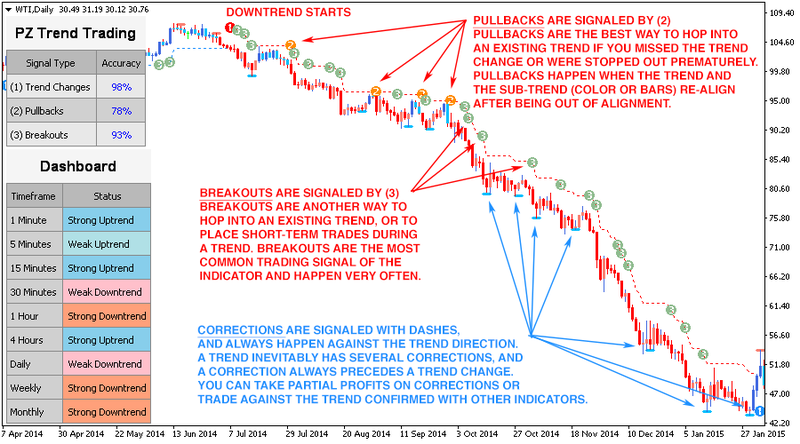 The Trend Trading indicator is the perfect tool for trend followers because it not only tracks the trend, but also everything that happens during a trend, which allows it to offer many more trading opportunities that other indicators. 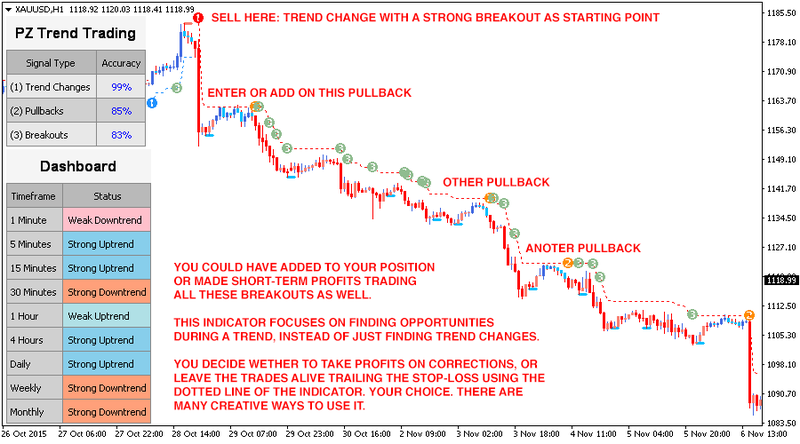 The Pz Trend Trading Indicator has endless possibilities but novice traders should focus on the easiest trading setups, which are (2) pullbacks and (3) breakouts of inside bars, because they are calculated taking into account the prevailing trend direction and recent price action. 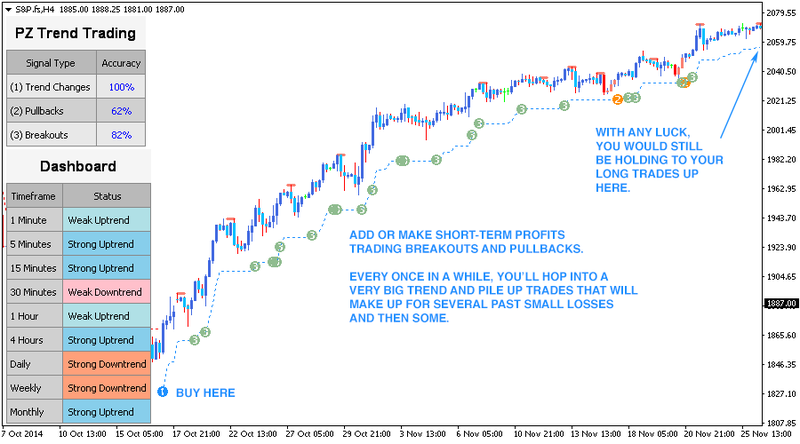 More than 85% of the pullbacks and breakouts are profitable, and some of then turn into really long, profitable trades. Novice trades should also avoid trying to exit the trade at the best possible point, and reduce the position management to a simple trailing stop using the main line of the indicator. This eliminates room for anxiety or judgment errors and allows profits to run. Novice traders should stick to this position management strategy until they can pyramid positions comfortably. Novice traders should trade daily and weekly charts, to avoid wild volatility swings or paying outrageous brokerage commissions compared to the potential profits of their trades. The market is pretty much like a video-game which has different levels. Novice traders should not trade H4 charts until they are constantly profitable in D1 and W1 charts. The market evolves and revolves around different stages, with only one goal in mind: race up or down with as fewer participants as possible. The market will always retrace and try to stop you out, testing your stamina and discipline over and over again. The price is ultimately unpredictable. This is why you need different trading setups: to react properly to what the market is doing. The key to profitable trading is adaptability. By learning four trading setups you will be able to trade any market in any stage without staying on the sidelines while the market is moving strongly. 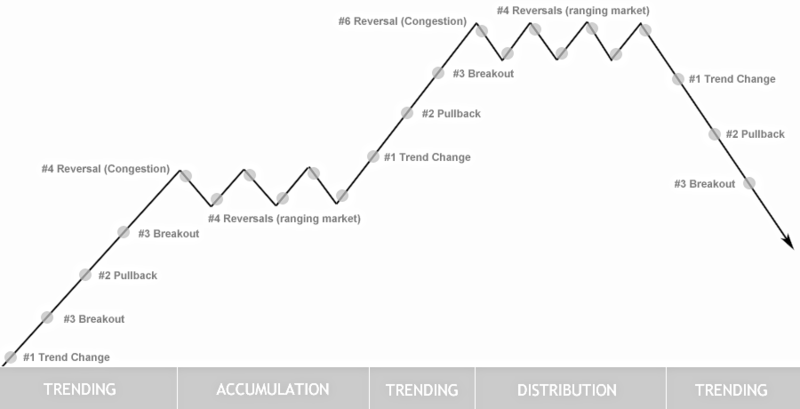 The following graph illustrates all the trading setups and the different market stages where they take place. A trend change takes place when the market changes its direction. 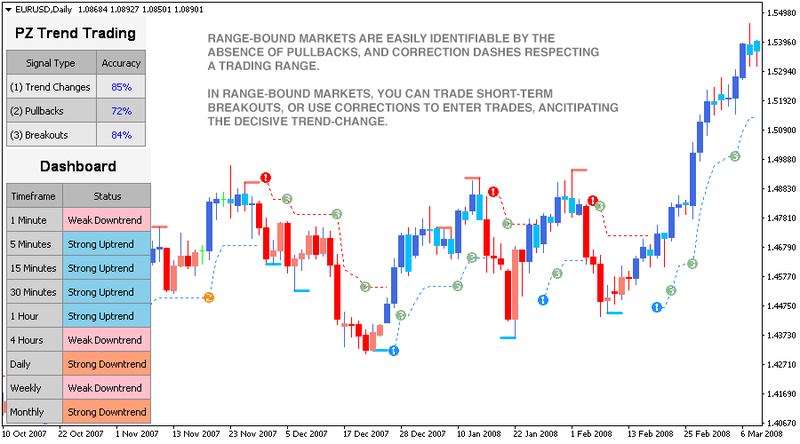 Trend changes are displayed on the chart using colored circles with a number one in it. A blue (1) signals the start of an uptrend, and a red (1) signals the start of a downtrend. 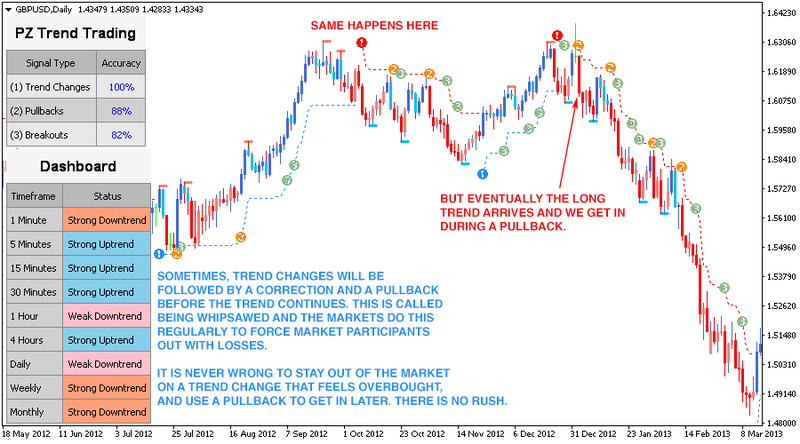 Trend changes are not the result of evaluating recent price action, which means that the trading setup has no timing. If you are using this indicator properly, by the time a trend change has taken place, you will be already in the market (see corrections below). Once a trend is in motion, the market shakes up and down as winning hands reap profits and other market participants get into the market. A pullback is a retracement during a trend that represents a good buying opportunity, normally caused by big players reaping profits and selling their shares. If the market resumes up after a pullback, the indicator will plot an orange (2) on the chart. 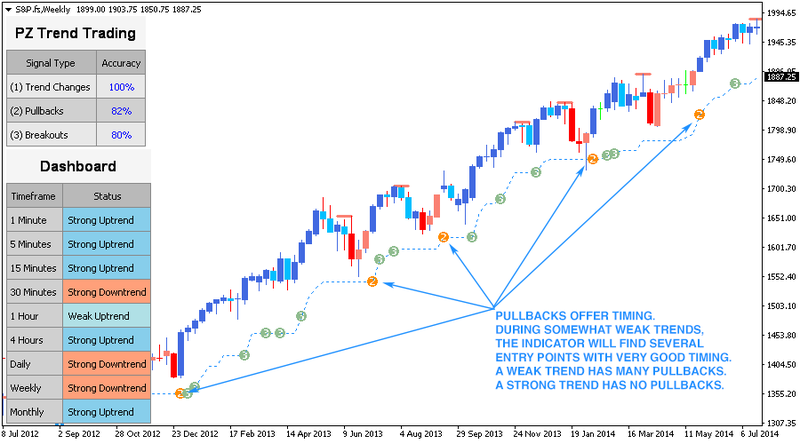 Pullbacks are very good trading opportunities but might not take place during very strong trends. An inside bar is a bar (or a series of bars) that is completely contained within the range of the preceding bar, which is known as the mother bar. 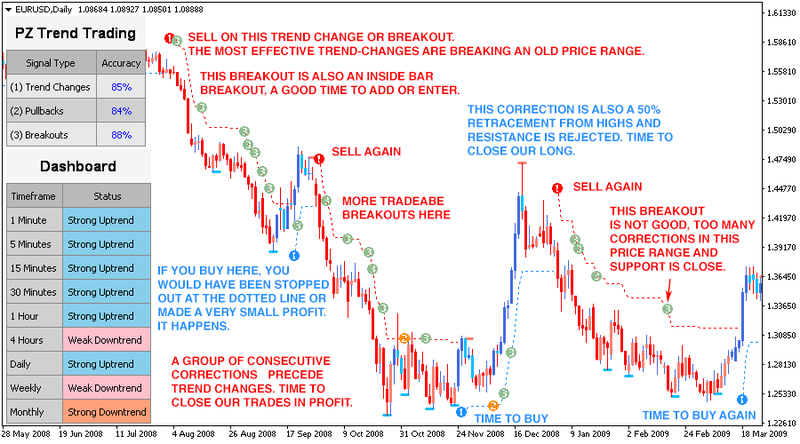 The breakout of an inside bar (or bars) represent the most profitable trading setup during established trends, because the risk reward ratio is extremely high: it is a high-probability entry point that provides traders with a good risk reward ratio since it typically requires smaller stop losses than other setups. The indicator will plot a (3) when a breakout of an inside bar (or bars) has taken place, and it is a great opportunity to hop onto the trend or to pyramid your positions safely. A correction is a liquidation of shares that is strong enough to trigger a pullback if the market resumes its direction, or a trend change if the price correction reaches the trendline. 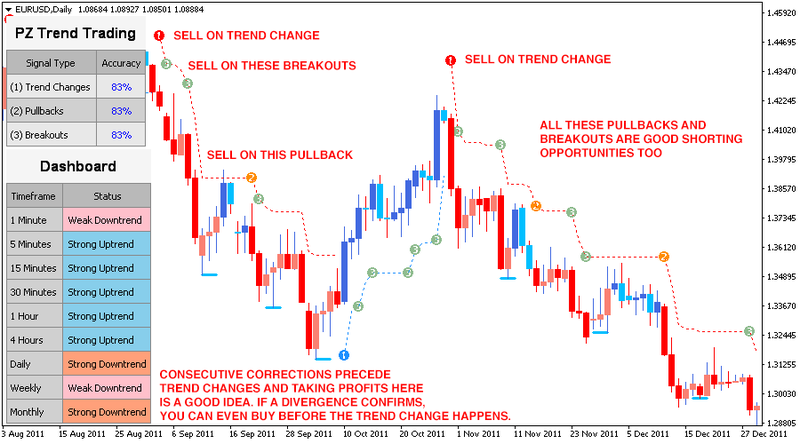 Every pullback and trend change is, always and in all cases, preceded by a correction. The indicator will plot a colored dash when a correction is detected, a red dash (---) is a bearish correction during an uptrend and a blue dash (---) is a bullish correction during a dowtrend. Bear in mind that the market does not simply reverse: every trend moves until exhaustion, and only then reverses. The key is confirming the trend exhaustion before the market has reversed, and using a correction signal to get into the market ahead of the crowd. 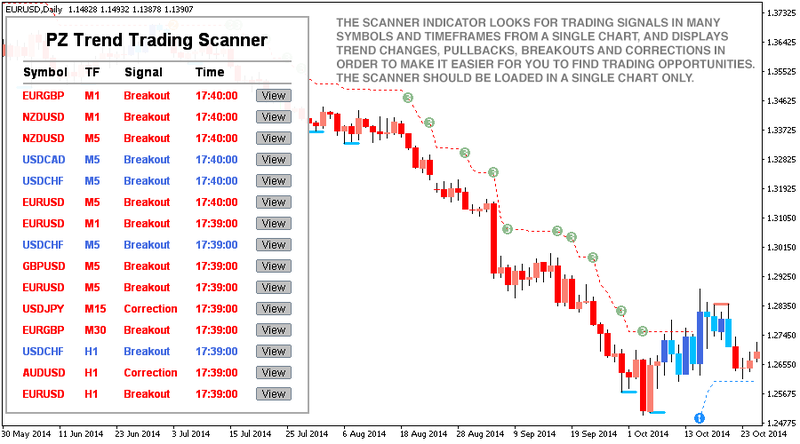 After some time using the Pz Trend Trading Indicator, you will spot exhaustions easily. This parameter controls the sensitivity to trend changes. A big period will lead to longer trends being captured. A small period will lead to shorter trends being capture, but a faster recognition of trend changes. 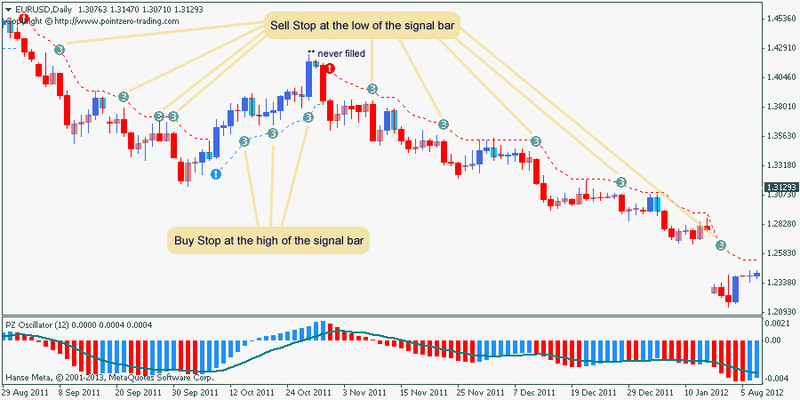 Enable this parameter to see the sub-trend reflected in the color of the price bars. 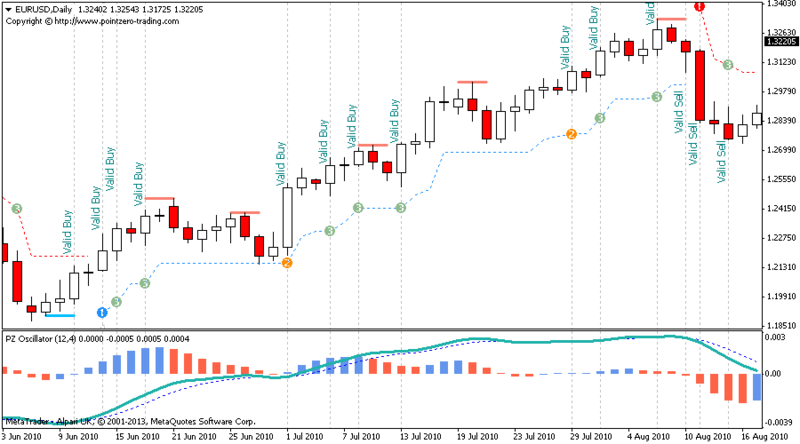 Enable this parameter to see pullbacks, displayed as (2) objects in the chart. 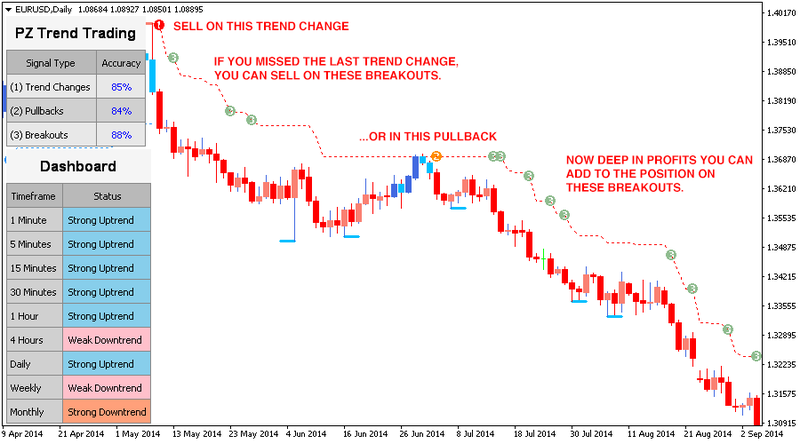 Enable this parameter to see breakouts in the direction of the trend, displayed as (3) objects. 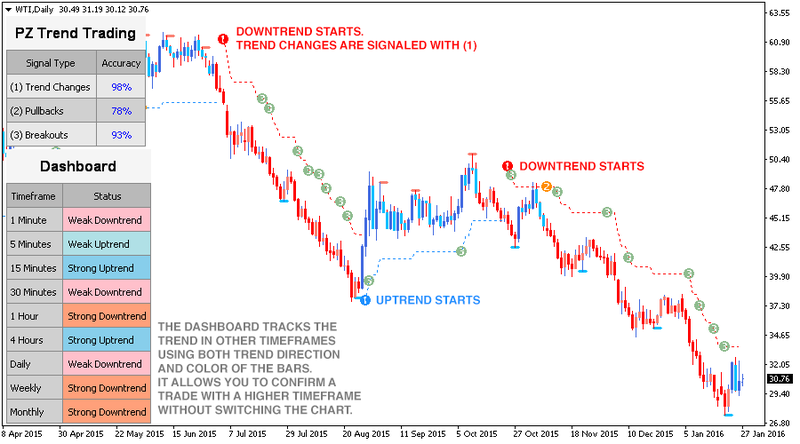 Enable this parameter to see trend corrections, displayed as colored dashes. This parameter controls how many past bars are examined upon loading of the indicator. 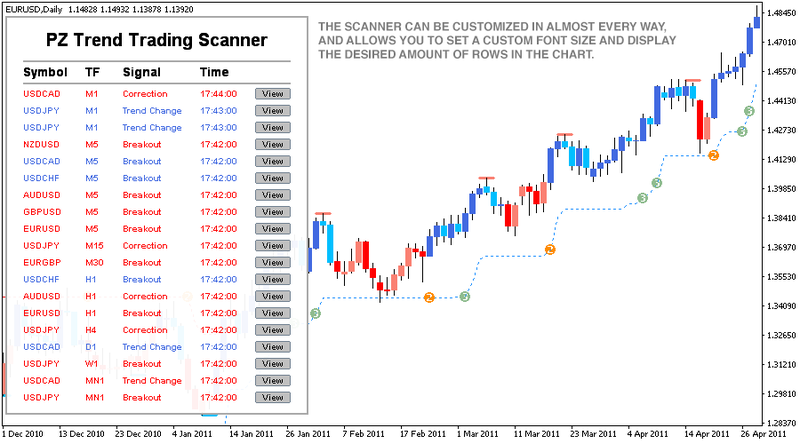 Enable this parameter to see the multi-timeframe dashboard on the chart. 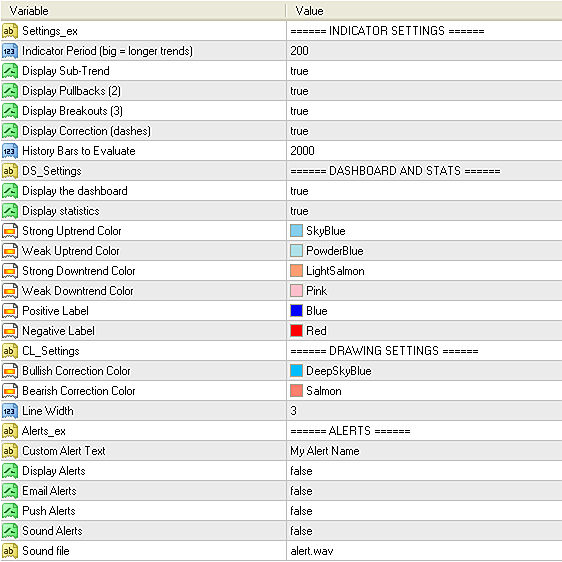 Enable this parameter to display the stats dashboard on the chart. 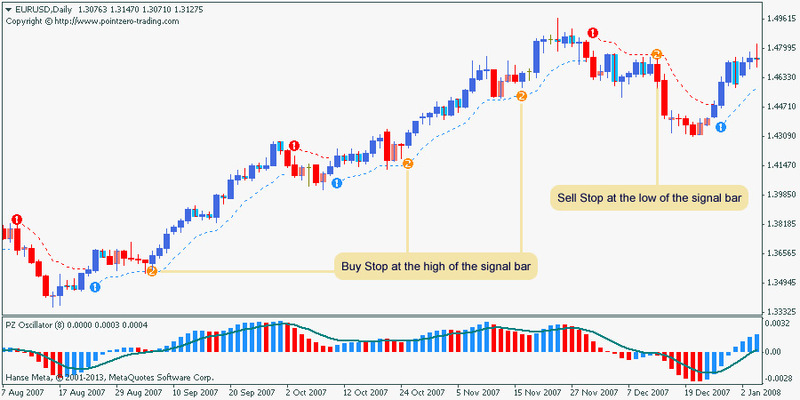 Choose the color and width of the correction lines displayed on the chart. Enable display/email/push/sound alerts for all the trading setups enabled above. No, the indicator is non-repainting and non-backpainting. What should I trade with this indicator? Trade everything! Any market with price and volume is suitable for trading. We trade indexes, forex, commodities and stocks. I am a novice trader. Can this indicator be useful to me? Absolutely! It will keep you on the right side of the market and prevent costly mistakes. Can I move the dashboard on the chart? Yes, you can drag and drop the dashboard anywhere on the chart. Will this indicator make me a profitable trader? Trading requires skill and no tool can replace you. But one thing is for sure, this indicator will improve your trading returns. Just don't panic if you have some down months. Trading is a waiting game and profits come in bunches: you sit, you wait, and you make a lot of money all at once. Is this just another trend trading indicator which gets whipsawed to death? No, it is not. 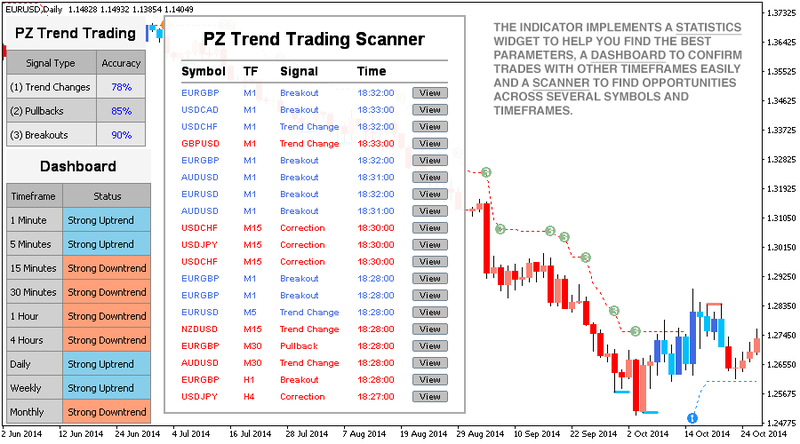 The PZ Trend Trading indicator solves the timing problem by detecting pullbacks and breakouts. Some trend changes will inevitably retrace and stop you out, but pullbacks and breakouts increase your payoff more than enough to obtain exceptional returns. How much trading time is required to achieve good results? If you follow a trend following system, very little. Most top traders manage their trades in 10 to 30 minutes per day, which is enough to check the state of the market and update their positions. Trend following, unlike high-frequency trading, uses weekly and daily data and needs little or no attention during the day. What timeframe should I trade? 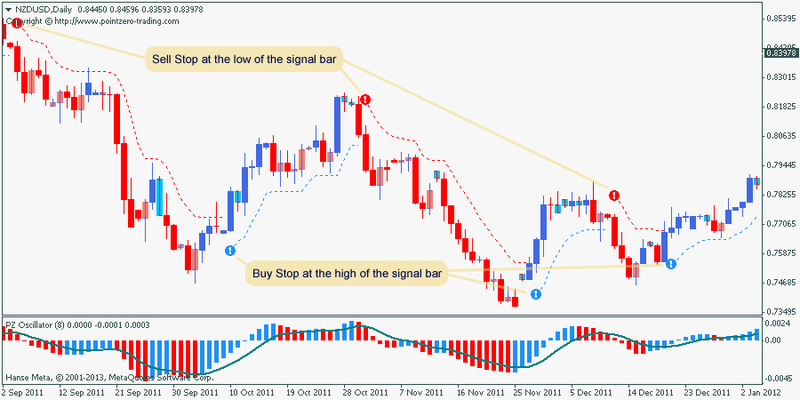 We suggest trading Weekly, Daily and H4 charts. Why? Because we don't like to work that much or paying a fortune in commissions. Intraday trading is very fashionable and exciting, but succumbs to decreasing profit potential and increasing trading commissions. The ultimate winners of scalping are brokers, and most traders resort to intraday charts because their expertise doesn't allow them to find enough trading opportunities in daily charts. Does this indicator implement alerts? 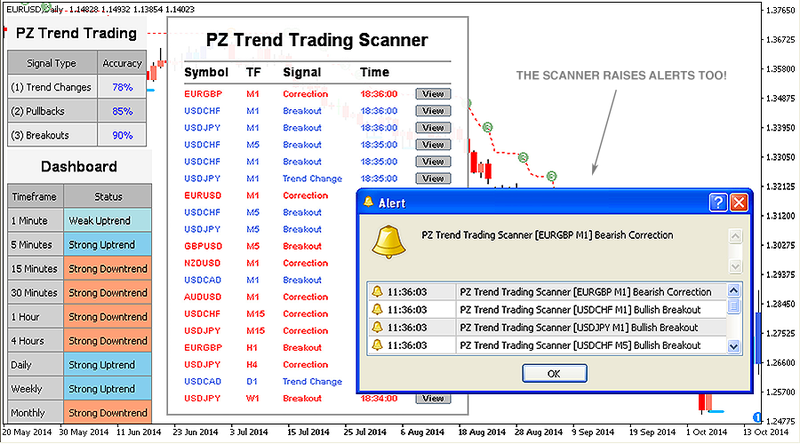 Yes, it implements email, sound, push and visual alerts for every trading setup. In order to build your expert advisor, you can read data from the indicator using the iCustom() function as exemplified below. The indicator has one extra buffer which only purpose is to store trading signals as constants: this is the only buffer you need to read from. Copy and paste the code below into your EA, and replace the indicator name of the iCustom() call with your own.